We are now accepting 2019 Veggie Club Memberships. New in 2019 – vegetable pickups will be on Monday from 5:30- 7:00 at our place. We will not be offering Tuesday pickups at the Whitefish Farmers’ Market. We will have our booth at Market but we won’t have CSAs at market this year. If you would like to setup a payment plan please send us an email and we will gladly workout a plan with you. What is a Veggie Club Membership? Veggie Club Memberships, formally called “Community Supported Agriculture Farm Share” is a membership (much like at Costco) for 20 weeks. You, the “Member ” purchase in advance (by April 1, 2019) a “Share” of our harvest. Then starting in mid-May the Member will come weekly to pickup their “basket” of produce. By becoming part of our Veggie Club you are sharing in our weekly harvest. This is different then shopping at a health food store or even the Farmers Markets. Your weekly veggie basket is comprised of fresh seasonal produce off of our Farm. A Veggie Membership is a wonderful opportunity to be reacquainted with the seasonality of food. By offering Veggie Club Memberships, we aim to cultivate a healthy community with food as the foundation. Not only will you get to know us as your Farmers, we get to know you, our community. It is important to understand that being a Veggie Member is both an investment and a risk. Together we are sharing in the risks and rewards of farming. We have to understand that we are growing in the Flathead Valley, which has unpredictable weather (summer hail and frost, drought, fire) and an average of 120 frost free days. Other risks include: insect and disease pressures as well as soil fertility, which we mitigate using methods that comply with organic standards. If you ever have a question about our practices just ask! What to expect in our Veggie Club Membership? We offer three membership options: a Full Basket, Partial Basket , and a Greens basket. SOLD OUT FOR 2019 The Full Basket: In the spring the full share are comprised mostly of greens, as they are quick growing. We do our best to offer a diversity of “greens” ranging from arugula, mustards, spinach, baby lettuce, tatsoi, kale, and chard. May also offers, rhubarb, radishes, bok choi, and spring onions. June brings beets, head lettuces, broccoli, garlic scrapes, cilantro, dill, peas, mature kale and chard, carrots, and mini onions. July and August are the peak of summer vegetables diversity! During these months the shares are filled with cucumbers, summer squash, carrots, broccoli, fresh garlic and onions, beets, basil, cherry and slicing tomato, new potatoes, peppers, romaine, iceberg, bibs oh my! September produces the harbingers of fall and winter; winter squash, storage potatoes and onions, carrots and beets, cured garlic, and the return of cooler season greens like spinach. In addition to fresh produce, once a month our CSA Farm Share, includes stone milled organic flour. We source the whole grains (wheat, rye, spelt, kamut, and corn) from Montana Milling in Great Falls and mill it on our granite stone mill. SOLD OUT FOR 2019 The Partial Basket: will be similar to the full basket in diversity only about 2/3 the quantity per week. The Greens basket: Each week you will receive a pound of various seasonal greens. 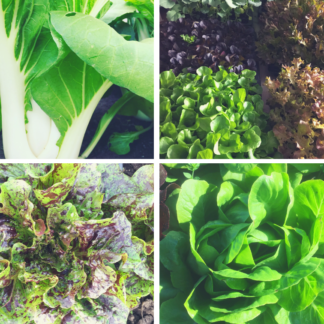 The greens you should expect throughout the season will include: arugula, beet greens, bok choy, various head lettuces, spicy greens, kale, chard and more.